First of many: That's this installation of Indra LED road lanterns in Polkowice, a town in south-western Poland. 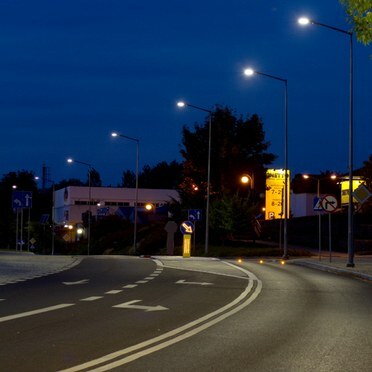 The budget-friendly lanterns were chosen because of their ability to meet and satisfy Polkowice Municipality's growing demand for white light of low glare, good illuminance and uniformity combined with a maintenance-free energy efficient performance. Designed for use with high-efficacy 4200K LEDs the distinctly shaped lantern incorporates a flat glass optic within a sleek grey canopy and is just right for use on strategic routes, subsidiary roads and residential streets (up to lighting class ME2 is achieved in Polkowice). The optic eliminates upward light above the horizontal plane and their long life minimises maintenance requirements.